Adding meta tags you can get get more traffic from search engines like Google,Yahoo,Bing,etc. Especially the meta description is the most important one. Meta tags are the tags which describes your site and tells the search engines what your site is all about. Adding meta tags is an important factor in SEO. (Search Engine Optimization).Meta tags allows search engines to index your web pages more accurately. In other words,Meta tags communicate with the search engines and tells more information about your site and make it index correctly and accurately. 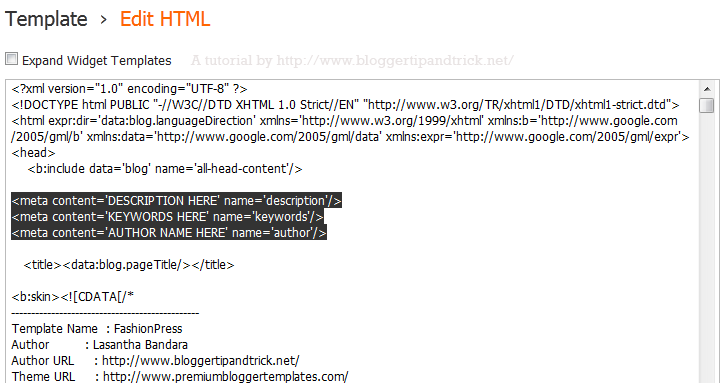 1.Go to "Template" --> "Edit HTML" of your blog. 3.Now add below code just after the above code. Now save your template. You have successfully added meta tags to your blogger blog. How to add more name in author name and in keywords. I am looking such type of information, due to this I have implement the meta for my blog. Thanks for providing such a meaningful information. I like it and the way of presentation. Thank you, thank you! Most helpful and easy too. Thanks for the info, it was very useful to me. Thank you so much! Your steps are so clear and the code actually works (there were several other sites that had incorrect coding)! blog now! but Im unable to moderate the comments!! the facebook forums say that add meta tags before 'head' like this meta tag with FB USER ID But I have tried this doesnt work. Another issue is I cant generate my application ID as the validation code on my mobile doesnt appear till now. Please help how can I moderate my facebook comments on blogger! thank you! !on blogger! thank you!! Thank you so much Lasantha.. Thanks for this tip.How about For every post? why is it different meta tags i've read for many blogs post. Good! But you did not tell us how to add a meta tag when one is trying to Authenticate a new blog. Like submitting blogs to yahoo site explorer. good work....by the way how to add meta tags for each post in bloggers..
Good share for new bloggers..
Sir, i need the yahoo meta tag that is sitemap for producing sitemaps in yahoo . finally, i learned how to put meta tags in the html code of my website. i am studying how to make my site google friendly and to have a few visitors at first. hopefully i learn a lot more from this site. thanks a lot! God bless you my friend! it was just perfect and i love that great sharing! Thanks for making me to understand how to add meta tags, description to my blogs. Thanks a lot for sharing this great info here. It is very helpful for me and another blogger who want to add meta tags and many other things. Today I added meta description and meta tags by helping your post. I faced some problem but after reading your post, it is easily made. Thanks for the information. Do I have to add meta tag to each post? Thank you so much! Best instructions EVER! how long does the change to the meta tags take to take effect on search engines? It was very easy to read and to follow. It took me a couple of minutes to add the tags. Thanks! You made this SO EASY!!!!!!! I have been scared to death to do this! I figured I would mess something up. THANK YOU SO MUCH!!!! YOU ROCK!!! Thanks dear i was looking for this but now i find it and implemented to my blog. Awesome!!!! Your the best, thank you for sharing this. Very useful and simple to follow! Cheers. Thank you so much! It works like a charm. You are a genius. Have a very wonderful day. Thanks for the guide. I like this method, look simple. Excellent! I did this with no problem! Thanks a bunch! Big thanks! it works like a charm in my site. Thank You very much. I have done it in my blog. Thank you so much. I was looking this solution from many days.